I love oatmeal, so in the morning I would probably have some form of oatmeal with cinnamon and vanilla. I like it kind of sweet, so it tastes like a treat – like a dessert with some fruit. For lunch, I would probably try to keep it lighter, like a salad with grilled fish or a piece of salmon with some quinoa or a grain. I always have a Chai or Earl Grey tea at some point during the day. I don’t drink coffee; I’m a tea girl , that’s my form of caffeine. For dinner, I’m a huge sushi fan. I also love a really good Indian Curry. What I love the most about going out with my friends for dinner, though, is that they’ll surprise me, and we’ll go somewhere new. Sometimes, the surprise meals are the best because you can’t pre-plan your menu. For dessert, I’d go to Salt & Straw; I just went there for the first time, and they have the most amazing vegan coconut Stracciatella. I like places that have options. My ideal day would, honestly, be having someone take me out to experiment with different things. Working out is my private time. I love sweating to get out your emotions; I always feel better afterwards, always more energized and just more clearheaded. I always drink a lot of water, too, to really purify. I sometimes try to meditate with music, or just have quiet time. It really allows me to center myself and get away from the craziness of work and the city. I really believe in laughing and smiling a lot. I think it’s really important, because when you feel the most confident and the most happy, that’s when you feel your most beautiful and look your best. I always say that a smile is your best accessory. In the morning, I’ll wake up and splash some cold water on my face to wake myself up and then I use the Lancôme Énergie de Vie products. They’re designed to take get rid of all of the pollution your skin takes in from the environment; they’re very clarifying. I use the face wash, the serums, and the creams; they’re all amazing. I have to put on sunscreen to protect my skin; I’m really into Kiehl’s sunscreen. I use their lip balm as well. Obviously, at night, it’s always super important to take off your makeup. I must. I can’t go to bed with anything on. I’m a big fan of using the Lancôme Hydra Zen Anti-Stress Moisturizing Cream at night; it’s not too thick, but it really moisturizes. What’s always in your fridge and pantry? I’m a big fresh produce person, so I always have fresh apples and other fruits and veggies around. I also love my tea, so I have a collection of teas. I love baking; I always have every baking supply that I could possibly need in case I get inspired. I like to have all the different gluten-free flours, extracts, dark chocolate, quinoa, some kind of grain, and obviously San Pellegrino and sparkling waters. You’ll also always find some form of takeout. If I go out, I don’t like leaving things, so I always take leftovers to go. If I get a salad, and I really like the dressing, I ask for a few extra to go, too, so I can put them on my own salads at home. 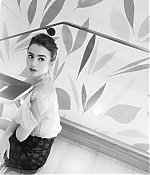 WWD – Lily Collins had it easier than most imagining what life would be like for an ambitious scion of a showbiz family navigating the professional, personal and gender politics of Thirties Hollywood. In her new Amazon series “The Last Tycoon,” loosely based on F. Scott Fitzgerald’s unfinished novel, she’s never far from the storied history that pervaded her youth. Along with being a second generation star, the daughter of pop icon Phil Collins has been time-traveling to Tinseltown’s Golden Age since she was a kid, her mother Jill has long been involved in preserving, restoring and showcasing historical sites in the Hollywood region, including Beverly Hills’ grand 90-year-old Greystone Mansion, which serves as her character Celia Brady’s family home. The ruched bodice, puff sleeves and the A-line skirt were crafted from silk and duchesse satin. Taking on her first TV series since “Mad Men,” Bryant was ready to immerse herself in an entirely different place and time. “After eight years, as much as I loved working on that show, I felt ready to design something new,” she admits. Yesterday, Lily attended the Build Series with Kelsey Grammer to discuss The Last Tycoon! Lily looked beautiful! You can find HQ photos from Lily’s appearance in the gallery as well as watch the interview below! Lily graces the cover of the July issue of Glamour Mexico. You can find the cover and a few outtakes in our gallery. Stay tuned for scans! SHAPE – Have you ever watched a woman in a movie get a beauty makeover and a new wardrobe and acquire instant confidence (cue the triumphant music)? Sadly, it doesn’t happen like that IRL. Just ask Lily Collins. To celebrate her debut on the cover of Shape, she went to dinner with two elementary school friends after the shoot and reminisced about how awkward they all felt about their bodies as teens. “We wore boys’ board shorts over our swimsuits!” she says. The irony that Collins, 28, was unwaveringly confident and at ease on set all day in one revealing swimsuit after another was not lost on her. “I never dreamed I’d be posing in a bikini on the cover of Shape. It’s a complete 180 for me. It’s a magazine about what it means to be healthy,” she says. Speaking her truth to her inner circle eventually set Collins free to share her story with the world—and because of her journalism background, she had the chops to do it. At 15, she became a correspondent for Elle Girl U.K. (she spent a lot of her childhood in England), and in 2008 she reported on the U.S. presidential election for Nickelodeon. She was later a contributing editor for CosmoGirl and the Los Angeles Times Magazine. Her recently published book, Unfiltered, details her experience with her disease and ended up being “even more honest than I was intending,” she says. “I didn’t realize I’d cover so much.” But she was ready to talk. And that’s a good thing, because she has a lot to say. Here are the chapters on her recovery. I have added additional outtakes from Lily’s photoshoot for Glamour in 2013 and Modern Luxury from earlier this year. Thanks so much to the Russian fangroup Lily Collins Network for sending these our way. Check them out in the gallery! I hope you all love them as much as I do! 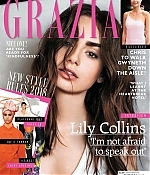 Lily is featured in the Summer issue of Crash. I have added some digital scans along with some outtakes from the magazine! Thanks to my friend Lora at Adring Lucy Boynton for the photos! A new promotional shoot Lily did for Lacome has been released. These photos are so beautiful. Check them out in the gallery! I have updated the gallery with several portraits Lily took at her time during the Cannes Film Festival.